Do Fast Radio Bursts Come from Flaring Stars? One of the most intriguing discoveries in radio astronomy in recent years has been the discovery of Fast Radio Bursts (FRBs). Originally called Lorimer bursts after the first (and for some time, only) burst observed, there are currently six of these bursts published in the literature, and astronomers are puzzled because they look very different from any other astronomical signals observed before. They are bright- FRBs are the brightest astronomical phenomena seen in radio frequencies, and they don’t seem to have known counterparts in other wavelengths. They are brief- a burst only lasts a few microseconds, and they don’t seem to repeat. And they have a very high dispersion measure (DM)- a relationship between time and frequency that tells you how far away a signal comes from (explained well in this Astrobite)- which has indicated an extragalactic origin for FRBs. To writ, what exactly FRBs are and where they come from is a mystery. In this paper, the authors decided to take a different track from previous theories about FRB origins that point to extragalactic sources, and instead tackled the option of a much more local origin. Their proposed candidate sources are flare stars– variable stars which can undergo dramatic and unpredictable increases in brightness. Flare stars are typically dim dwarf stars, and some are already known to produce radio bursts with brief rise times on the order of milliseconds, thought to be produced by cyclotron maser mechanisms in the stellar atmospheres. Further, the authors argue that if FRBs are produced at the bottom of the stellar coronae of their host stars, or create coronal mass ejections of their own, the FRB radiation would likely pass through a plasma blanket which could create the high DMs. Figure 1- The FRB100703 field. 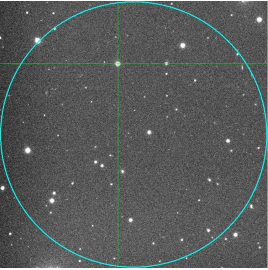 The circle indicates the 14′ FRB beam’s FWHM, and the cross shows the location of the observed variable star. In order to test this hypothesis, the authors used the Wise Observatory 1-meter telescope in Israel to monitor the fields of three of the currently known FRBs for flare stars, where the fields encompass the FWHM of the radio beam which first discovered the FRB (see Figure 1). 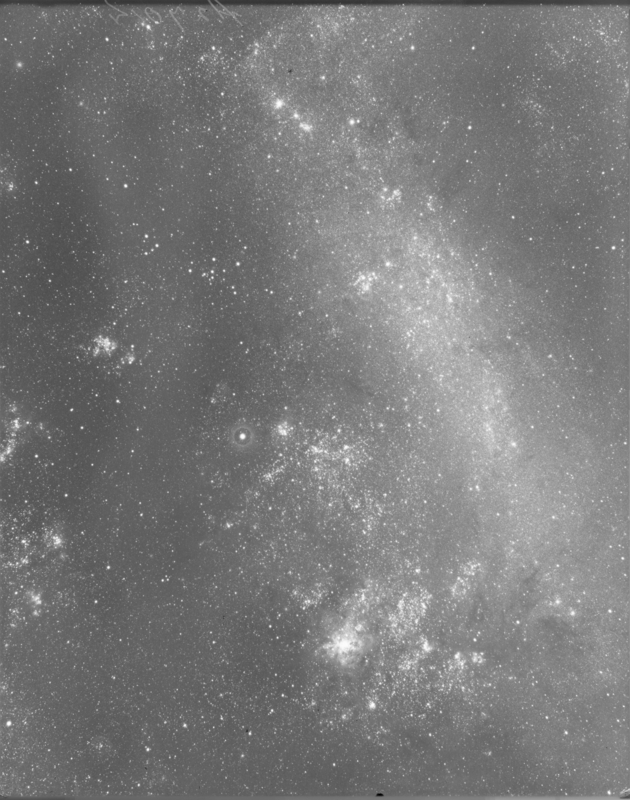 The fields in question were imaged to a square degree with a CCD camera, and then observing stars within a 14’ diameter of the FRB for photometric variability. In two of the FRB fields, no stars varied over the time period the authors monitored them, though there could be variable stars that were too faint for the instrumentation setup, and one star was so bright in one of the fields that it over-saturated the readings. For the third field, however, the authors did identify one bright variable star in the field of FRB 110703- a magnitude 13.6 star with a period of 7.8 hours and a G-type stellar spectrum. Based on these results the authors conclude it is likely a W UMa eclipsing binary star, a system in which two stars are in such close contact that they share an envelope of material (so plenty of moving plasma in this system!). Further, from their total collected data and the known frequency of W UMas, the authors argue there is just a 5% probability of randomly finding a variable star this bright and with the amplitude observed in the field. 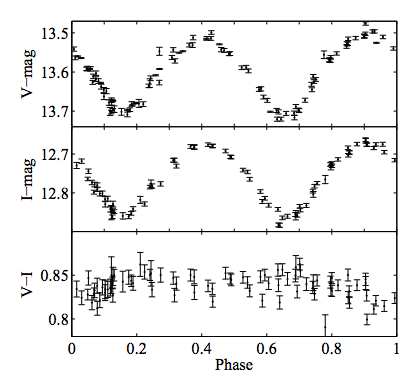 Figure 2- The folded light curve of the variable star in the field of FRB 110703, with a period of ~7.8 hours and a 0.2mag peak-to-trough amplitude. This study is, of course, not definitive proof- the authors acknowledge the star’s location could be just “a chance coincidence,” additional detections of flare stars near FRB locations are needed, and there have still been just a half dozen FRB events observed in the first place so there is scant data on them. But the good news is even if FRB observations are new they might not be rare phenomena at all, as the data collected so far suggests there might be as many as 10,000 FRB events in the sky each day! (It’s just with such a brief, non-repetitive nature they are very difficult to detect.) With such a high event frequency, and with new wide-field radio surveys coming online now such as LOFAR and the MWA, hopefully new events will provide additional clues on the origins of FRBs.